If you do a mix of interactions with Autodesk, then they may be able to find out who you are. Is that a concern to you? You may not be anonymous if you submit trouble reports and get involved with the Customer Involvement Program. You should think about getting involved. There are many ways to provide feedback to Autodesk. The CIP is one of them. I will continue to blog on this subject as we work through the issues of what information they gather and what they do with it. For now, you can check it out in your 2008 products by going to the Help Menu. You can turn it on and off from your Help pulldown. 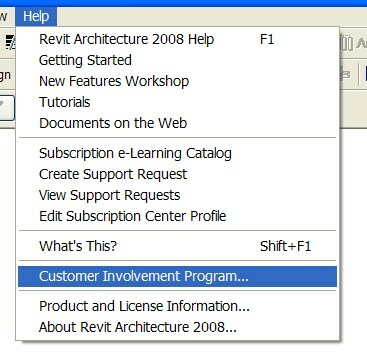 PLEASE NOTE: Customers that participate in the CIP Program and also submit Error Reports to the Customer Error Reporting (CER) program may provide enough common information so their CIP information is no longer anonymous and may be linked to all data you have provided Autodesk, including, without limitation, your email address. If you are uncomfortable with this situation, please do not participate in one or both programs. How do I participate or stop participating? You can choose to participate or stop participating at any time by accessing the Customer Involvement Program dialog in the product help menu. Your choice applies to all Autodesk products installed on the computer your choice is made. Where is my data transmitted, stored and processed? When your products send CIP data to Autodesk, it is sent in an encrypted form over the internet. When Autodesk receives the information, security technologies and procedures protect that information from unauthorized access, use, or disclosure. The CIP information will be stored and processed on Autodesk computers in the United States. At times, however, CIP information may be processed and stored in other countries where services are being provided by a licensee, agent or service provider of Autodesk. In these cases, the personnel working with the information are required to maintain confidentiality. Autodesk may at times aggregate CIP information and share that information with partners. This information cannot be used to identify individual users. No CIP information is used or shared for advertising purposes.